Lazarus enables you to rapidly build applications for Windows, Linux, Mac OS-X and a range of other platforms. A minor snag with this versatility is that whilst Lazarus supports features common to all platforms, if your application needs an operating system specific feature you will need to write the code or get a third party library as an add-on. 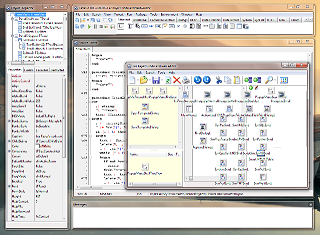 The IDE is reminiscent in design of Delphi version 7 - regarded by many as a classic version. It is undergoing active development and improvement. As you explore, you will discover many excellent features, some not found in modern Delphi. The multi-window screen layout becomes cluttered as you open more features, with windows becoming buried under others. A large monitor is advisable to get the best benefit from the rich feature set. A good component selection makes it easier and quicker to develop applications. Most programming tasks have been solved by someone else. Use downloaded third party components to drop into your application. Save development time by keeping a library of your own often used utilities and components. There is an adequate set of components supplied "out of the box" with Lazarus and you can add to these by download from various Web resources, in particular from the Lazarus CCR project. As common with most open source projects, the Lazarus developers spend more of their time coding than in writing documentation so that some aspects are thinly documented. The best documentation is the source code itself. Ctrl+Left-mouse-clicking on a class or method will take you to the declaration so that you can see exactly how it works. This is a good way of learning coding techniques from other developer's work. There is a Wiki where answers can be found to many common problems. Lazarus is free (as in beer) to use software with which you can develop quality freeware and commercial applications. It is a mature product so do not be misled by the lowly current version number. If you need a missing feature you can add it yourself. Submit a Subversion patch and maybe you will have the pleasure of seeing your work incorporated into the product. The thoroughly bug tested Release version can be used for developing commercial and enterprise class applications. The "daily snapshot" current development version can be used with confidence as "show-stopper" bugs are rarely found and soon fixed. Lazarus is not Delphi. It has a different set of features and objectives. Even if you own Delphi, Lazarus will make a usefull addition to your toolbox.